It has been said that every scientist has become a scientist as a result of being struck with a sense of wonder in childhood at something seen or understood. This applies not only to prospective scientists. The opportunities to be woken to wonders are so many, first in the world about us, the sea, the sky, the stars, the flight of birds, sunset and sunrise, mountains, lakes, deserts, cliffs, animals, plants, flowers, forests, a single leaf, scenes transformed by atmosphere, by frost, or by snow, the effect of light and the play of shadow, then people, skill, grace, beauty, and simply the human face, and, third, art, music, architecture, painting, sculpture, drama, poetry and literature - the list has merely been started. These wonders wake us up to a sense that there is something more in the world than our normal everyday preoccupations. Some years ago, we visited the cemetery at Evreux with our friend William Anderson, to pay respect to the grave of his father, killed in the war when Bill was about ten years old. We saw the grave, put flowers on it, felt sympathy for our friend, and we left. Recently his widow Jennifer has published his final collection of poetry "Imaginations". One of the poems is entitled "Evreux", and reading it my wife Colleen commented on the rich world of thought that must have been in his mind while we were there, beyond what we had experienced. We reflected on this with wonder. 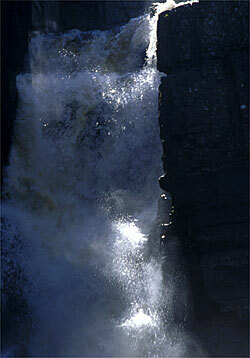 Those unmoved by the powers of nature and art are to be pitied. Our breath is taken away by the scale, grandeur, and power of nature; we listen to great music in silent comprehension; and we walk through the spaces of great architecture in a state of observant mental integration, freed from the commonplace associations of everyday mind. We wonder both at the creativity of art and at the skill, patience, and perseverance of the artist and craftsman. There is a relationship that is found throughout nature and our bodies, the ratio known as the Golden Mean or Golden Proportion. Apart from its appearance in nature and in us, it has great mathematical interest as a numerical series with a fascinating constancy. Successive numbers are related in the ratio 1:1.618, the ration between the sides and diagonals of a pentagon or five pointed star. It appears throughout our bodies, for example in the bones or our arms and hands, and even in our teeth, and it is presumed to have mental effects as well, and has been widely used in art and architecture, at least from the time of Classical Greece up to the present. It is found in Chartres Cathedral, in the sculpture and the architecture. Another more modern mathematical wonder is the Mandelbrot set, a simple equation that when recorded through its values as a graph (which could not be done until the coming of computers) produces a fascinating pattern, which some see as a beetle, and some as a Buddha, but which is infinitely detailed, producing the same figures again and again. Both the Golden Mean and the Mandelbrot Set have web sites devoted to them. Most of us are inspired by a sunset, and and find ourselves reaching for a camera. The characteristics of film and photographic reproduction can capture sunrise, sunset, and low sunlight in a powerful and evocative way. But sunlight can catch the alert eye at other times, and looking in the direction of the sunlight can reveal miracles of translucence and reflected light, for then water shines, whether a great waterfall or a single drop, hair gleams, whether a child or an antelope, and the edges of everything are lined with light, whether a single leaf or the columns of a courtyard. The sun has been a symbol of the divine from the earliest of times, and even in secular days light can be a telling symbol of mental illumination, an archetypal quality of the nature of mind. 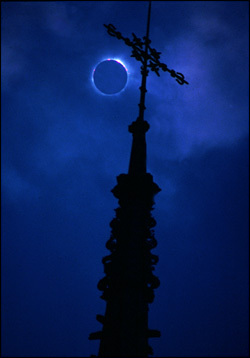 As many in Europe found in August 1999, an eclipse of the sun is an unexpectedly powerful event, which was greeted by the great crowd in front of the cathedral of Amiens with applause and cheering! The experience of a sense of wonder is a taste of understanding the comprehensive wholeness of the universe, an insight into the natural law that binds everything into one system, from the elementary particle to the galaxy. We can look at a tree and sense the beautiful harmony that governs it, and see the same harmony in a human hand or face. The human brain strives to unify its world, and the wonder that arises when a glimpse of this insight is given is pure joy.